Twitter a great way to find and service clients for your adjusting business. Now over six years old, Twitter is considered on of the “Big Five” of social media networking sites for businesses – Google+, Facebook, YouTube, and LinkedIn are the other four. As with any social media platform, creating an account is easy, but creating it properly and learning to use it successfully and profitably takes time and education. To get started, visit Twitter to sign up for a new user account. While the automated registration for Twitter will walk you through every step of the process, knowing ‘what’ and ‘why’ to set up your adjusting business on Twitter will get you started quickly on the road to Tweeting success! When choosing a name to use as your ‘Twitter Username’, keep in mind that you only have 15 characters (including numbers, letters, and some special characters – ‘spaces’ not allowed) so make them count! Think about how this Username will look on it’s own with an ‘@’ (pronounced “AT”) in front of it. How will it look on a business card? In today’s social network connected business world, any word/phrase with the @ symbol in front of it (and no word before it as an email address has) is now automatically assumed to be a Twitter username. Don’t worry if you need to shorten or abbreviate your Twitter Username to fit in the character limit, you have 20 characters for your ‘real’ name which can be your name, or of course be your full adjusting business name. Your Twitter username will become your identity as others see you on the social media network. Does the name you choose reflect your adjusting business name or services? 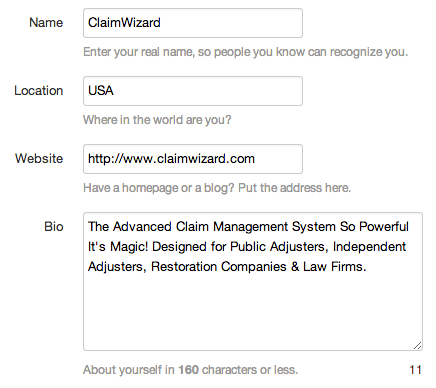 Our Twitter profile is @ClaimWizard and easily identifies the account as ours. Be warned that choosing names such as “Tom75”, “WaveRunr”, or “Jillie458” nicknames are very outdated and make you look unprofessional … and a spammer. Those old AOL chat handles need to be left in the last century! In addition to your 15 character Username and 20 character ‘real’ name, you are granted 160 characters in your Twitter Bio (found under Settings / Profile) that lets you tell others what you are all about. This is where you can talk a bit about the services you offer and how you can help property owners. Think about using the type of words or phrases here that a potential client would use to search for you. The location you enter into Twitter is up to you, but generally you should think about adding your city (or your nearest large city or metropolitan area) and state into this field. You can enter in multiple cities, space permitting. Next to your Twitter Username, every Tweet you send will have your profile avatar next to it. Just like selecting a great name, choosing a great photograph or logo is crucial to creating a professional image around your adjusting business. Be sure to use a professional-looking photograph of yourself (people want to do business with other people, so smile!) or the logo you use for your adjusting business. If you are currently using any other social network, you might consider using the same photograph or logo across all platforms for consistency. Profile photos can be up to 2MB in any of the following formats: JPG, GIF, or PNG. If your photo or logo is not square, Twitter will let you crop the image down to the proper dimension. We suggest a size of at least 600 pixels x 600 pixels wide. Twitter will assign you an ‘egg’ graphic avatar if you do not upload a photograph or logo and most people will not follow back an account without an avatar picture. In addition to picking an avatar picture, you can design your Twitter page with a background graphic and header photo. Need custom design help? ColourLovers has a great (free) program that connects directly with Twitter to design your background. While designing your Twitter background is important, remember that 43% of Twitter users access the site from their mobile device and will never see your artwork! While most people are either eager to jump in and start Tweeting – or fearful of not having anything to say – it really is best to start listening and following others before blasting out messages of your own. A large benefit of using social media network sites such as Twitter is the value in following other people or company accounts. Start by using the Twitter search function and look for other accounts Tweeting about things your adjusting business cares about, checking out the accounts behind the Tweet, and maybe following the account. See an interesting Tweet you’d like to reply to or share? Click on the Reply link to respond via Twitter to that account and message. What this will do is start a brand new message that directly addresses their Twitter account using the @ sign and lets you type in a response. Because Twitter only allows you to type 140 characters (including spaces) you will have slightly less area to type a response because the Twitter usernames uses up space as well. Remember that all Twitter conversations sent this way are public to the entire Internet and can show up in Bing or Google searches as well as Twitter searches. You can use this to your advantage by replying and posting thoughtful, helpful and educated answers for everyone to find, not just the person you are responding to. Our suggestion is to watch Twitter for a bit and jump into conversations a bit to get used to the ‘back and forth’ conversation of the platform. This will give you a feel for what type of content you will want to publish and get other people to participate with. Staring at a blank “What’s happening?” dialog box can be scary if you don’t have a plan! Rather than just blast out messages that pretty much say “HIRE ME!” with your phone number attached, think about how you can offer help or knowledge to people looking for your services. It IS acceptable to ‘advertise’ your adjusting business services on Twitter, but it not acceptable to ONLY advertise your services. When people click on your Twitter username, will they see that the last 20 messages from you are all exactly the same ‘pitch’ or do they see that you are sharing industry information, helpful tips, answering questions? Show that you are THE adjusting company they should contact at their time of need. Twitter isn’t the Yellow Pages! Sit down and write down ideas and tips you can share on Twitter that will help drive people to find you and your adjusting business. Do you read any industry publications that you can share a link to? Are you a weather geek that is always on top of the next day’s forecast? Share your industry-related interests and help people before they have a need for your services. After all, people like to do business with those they know, like, and trust – and Twitter lets people get to know your adjusting business through the content you share. No? That’s okay! It’s okay to learn while you go. The important part is to alway be trying new ways to grow your adjusting business and provide great service to the customers you already have. We know there is a lot here to read and think about. Don’t panic, we’ve created this article in PDF and ePub format for you to download. Take your time and go through the tips and enjoy reaching new customers on Twitter.